When we think of King David, it is easy to forget that he was in a lot of difficult situations. If anyone knew how to raise prayers for hopeless situations, it was this man. This was a man after God’s heart. Yet he was also a man of war. He was a man who was once trapped by lust and orchestrated his adversary’s death to take his wife. This is the man who went into fasting and prayer when he knew that his son was going to die. He was praying for God’s word through his prophet not to come through. And when it came to pass, we know that he got up and ate. The book of Job is filled with prayers and conversation from a man who was in an inexplicably hopeless situation. Job’s situation was one that went against everything that he and his peers believed. The man had walked in paths of righteousness for his entire life. Yet he was caught in affliction. How could anyone rationalise this? This may be the case for you today. Perhaps you are. In a place where you are saying, God what have I done wrong. We know from Job’s story that, sometimes bad things happen to good people. When you are in Christ, hope should never die! Let me rephrase that, hope can never die, when you are in Christ. Christ who is hope was nailed to the cross, placed in a tomb and rose! You cannot keep hope down. That same power that called Lazarus out of the grave lives today! The reason why it may be so hard for some among us to accept that God will pull us out of hopeless situations is because we have been drilled and raised on the faulty premise that “God helps those who help themselves.” It is quite the contrary. In fact we know from scripture that his strength is made perfect in our weakness. When we are helpless we can submit to him fully. When we think we have a way out we tend to want to take things in our stride. This means that we seek victories outside of the Lord. This is human nature. 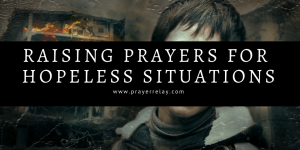 Yet, God, our father loves prayers for hopeless situations. This is what miracles are made of. When Mary and Martha would send for him while their brother Lazarus was unwell he didn’t come. That was not a hopeless situation. 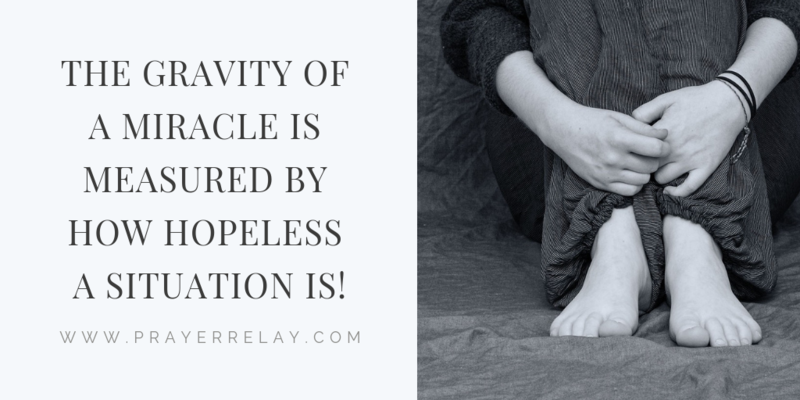 The gravity of a miracle is measured by how hopeless a situation is. 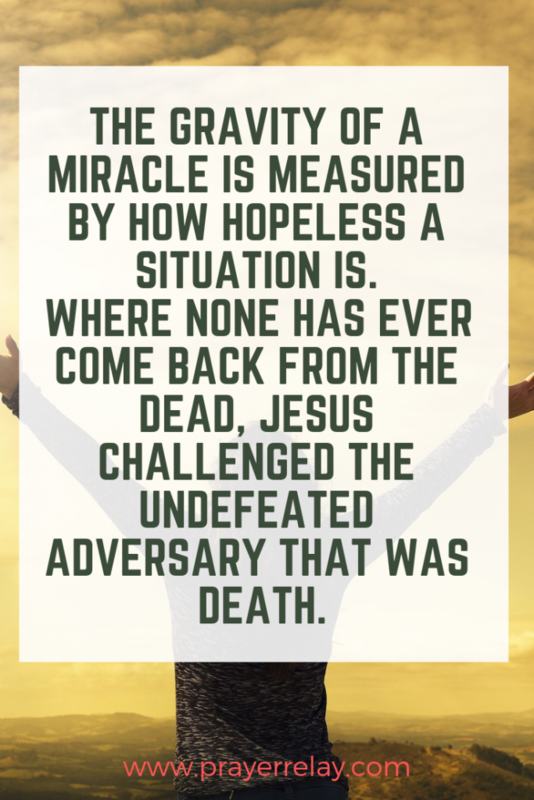 Where none has ever come back from the dead, Jesus challenged the undefeated adversary that was death. God is moved by the stubbornness of our faith. Our refusal to give in to what seems impossible and fully entrust it to him causes him to respond. There are countless situations like this in scripture. The Prophets of Baal Defeated. We understand that Elijah takes on the seemingly hopeless situation of challenging 450 prophets of Baal. This is one prophet defiantly calling out 450 opponents. These were opponents that had the support of the crown. He doesn’t stop there. He taunts them and mocks their phoney God. What’s even more daring is that he challenges the prophets of Baal, who was the “god of fire” to a duel that involves fire. He is, in fact, saying, my God is bigger even in your area of strength! He pours water, and his God answers by fire! Do you know the story of the Shunammite woman? The Bible tells us that she had no child, and her husband was old. God had given a son after the prophet had prayed for her. She had not asked for a child, but God had given her a son anyway. These were the words of a mother whose son had just died. It is well. The rest is history. God showed up and her son was raised from the dead. Now I don’t know what your hopeless situation is today, but we know our God starts where we have failed. He takes over where we are incapable. When we have given up on our own strength and chosen to then place it in his hands, that is where he functions best. Father I bless your name. You are God over these stubborn and seemingly impossible situations that stand against your people today. In the name of Jesus, raise possibilities where there are none. You are a miracle worker. You are a promise keeper. Dear Lord, you are a way maker. You are a God who makes a way where there seems to be no way. Right here and right now, Heavenly Father, there seems to be no way in this situation. Make a way for us oh God! We acknowledge that in our own strength this is impossible. We accept that by our own wisdom, there is no way. Yet, we also know that there is nothing too hard for you. Holy Spirit, minister to every one who will pray this prayer. Minister to everyone who will read this or listen to this prayer. You know their situation. As they place it before you, make a way. 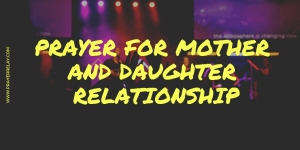 Why should we raise prayer for mother and daughter relationship? Mother and daughter relationships can be incredibly complex. Mothers, having been through life and trying to guide an often resistant daughter. And daughters trying to forge their own path. There is bound to friction. In some cases, it ends up in bitter hatred that is carried forward for a lifetime. Everything we see in the physical has matching causation in the spiritual realms. We understand that our battle is not against flesh and blood. Often times we are too blinded by our desire to be principled and right. This is while our daughters may be blinded by their stubbornness, or a resolve to do things their own way. If we as mother begin to understand that our wit and wisdom are not what carry our daughters forward. It is prayer that influences and guides there where words fail. One of the most inspirational prayer warriors I have read about is Mariama Thampy from India. She has a day set every week where she intercedes for her children. I believe it is every Wednesday that she fasts and prays for her children. Her book is linked to below. Get it. It is will transform your prayer life. This is important because most of the things that manifest later have already been seeded in the spirit. That is why fighting in spirit is key. I didn’t actually buy the book above. It was nowhere to be found online, so I emailed the author. I am eternally grateful to the wonderful man from Ireland. 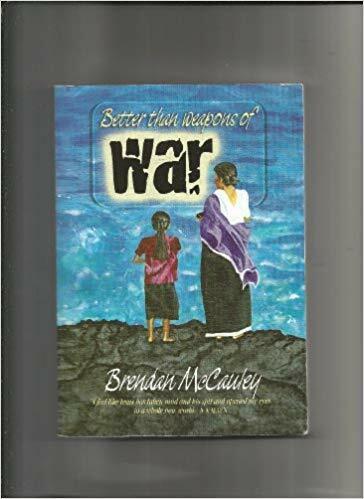 I received a package in the posts with several copies of this book, as well as another equally powerful one. May God reward him. Father, I bless your name. I thank you for my wonderful daughter. My prayer is that you would walk with her always. May her eyes always be drawn to the things of your kingdom. Guard her heart oh God, that she would not follow it unto distraction. Give therefore thy servant an understanding heart to judge thy people, that I may discern between good and bad: for who is able to judge this thy so great a people? Father, I pray that you would open my daughter’s eyes. Grant her the gift of discernment. Teach her to know what is right and what is wrong. Give her the strength and boldness to stand for her convictions. Lord even while she may be unmarried, may she never forget her worth. May her worth never be defined or derived from any man. 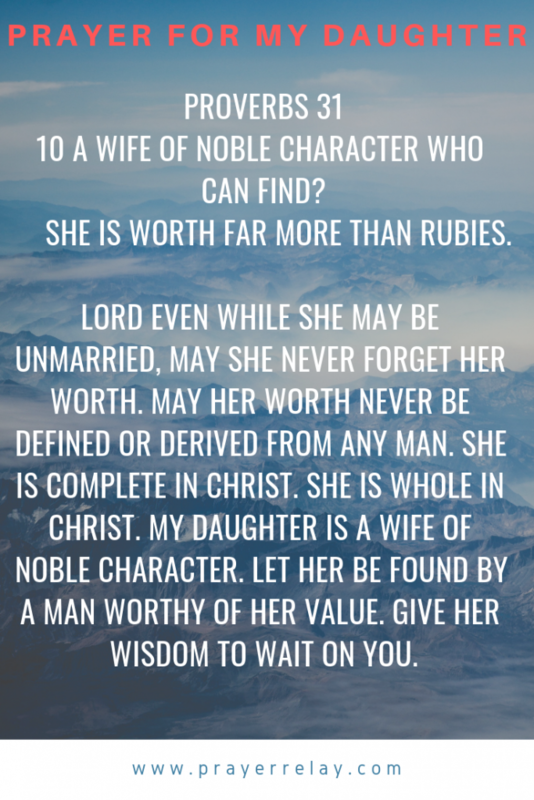 She is complete in Christ. She is whole in Christ. My daughter is a wife of noble character. Let her be found by a man worthy of her value. Give her wisdom to wait on you. Father, may she be filled with confidence in her self and in you. Let fear and doubt never be a plague for her. Whatever she sets her mind to, see her through, in Jesus’ name. She adds value wherever she sets her feet, in Jesus’ name. Let her bring good, and not harm all the days of her life! In Jesus’ name. My daughter is enterprising. She is a creator and a builder of things. Father, bless the works of her hands. May she never be comfortable in her slumber. She is a sower of seed and a smart harvester. Father, my daughter grows whatever seed is placed into her hands. She is a good steward. My daughter carries great value from afar and enriches those around her. My daughter is a provider! By her own hands and enterprise, she provides for herself and for those around her. Those we trust in her are blessed. 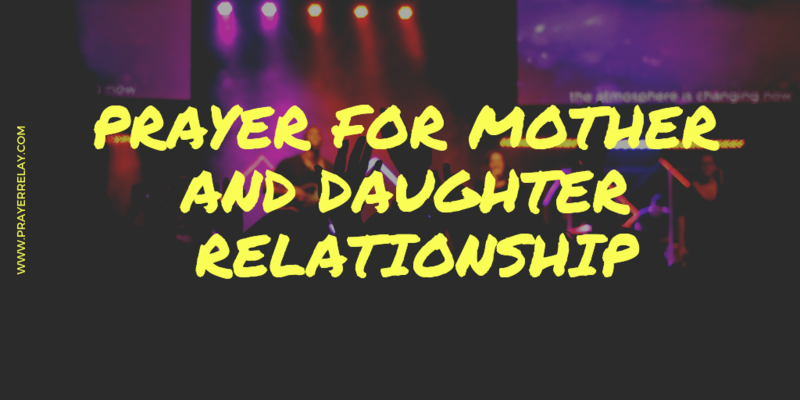 Lord, I pray for the relationship between my daughter and I. There will be no strife between us. Even when we disagree, you are our mediator, oh Lord. Keep peace between us. May our love for one another continue to grow. One of the most heartbreaking things that we have encountered in ministry is broken relationships. Mothers and daughters who no longer communicate. Grandchildren are cut off from relationships with their grandparents. That is beyond tragic. Our prayer today that God would bring resolution where there is need. Father, we know your breaks when families are torn apart. We stand with every mother and daughter that have been torn apart. Lord soften their hearts. Rekindle that flame of love in them. As you have forgiven them, and continue to, grant them grace to forgive others. 5 If any of you lacks wisdom, let him ask of God, who gives to all liberally and without reproach, and it will be given to him. 6 But let him ask in faith, with no doubting, for he who doubts is like a wave of the sea driven and tossed by the wind. 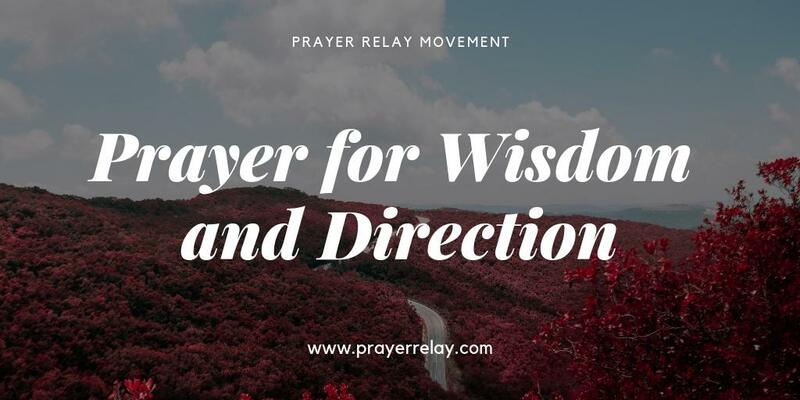 I have often wondered why we do not see more prayer for wisdom and direction. God knows that our world is in desperate need of these two. The problem is wisdom and direction are somewhat taboo matters. Very few people are ready to accept that they lack wisdom. They worry that this is to be viewed as some form of handicap. In a social media generation, we see more and more people looking to keep up appearances. We are more concerned about what people will think of us than who we really are. It is like scrubbing the front of your teeth and keeping them “colgate white” while they decay from behind. When you smile, no one will notice this. 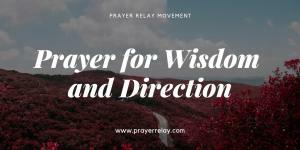 God encourages us to seek and in fact pursue wisdom. That is how desirable and perhaps somewhat elusive she is. Seeking wisdom and direction requires a combination of the presence of mind and humility. You need the presence of mind to know that you cannot do everything in your own power. It takes the presence of mind to know that you do not have to do anything in your own power, that the Lord is willing to take the wheel. Humility comes in the form of being able to then ask for help when you recognise that you are in need of it. The hardest thing to say is “help me.” We are taught from a tender age, to not show our weakness. We tend to forget that God’s strength is made perfect in our weakness. Which means by admitting when we are weak, and asking the Lord for help, we are one step closer to strength. 5 Get wisdom! Get understanding! Do not forget, nor turn away from the words of my mouth. Love her, and she will keep you. And in all your getting, get understanding. In the scripture above, King Solomon pleads with his child. He highlights the importance of wisdom. It is the “principal thing”, is what he has to say of it. Wisdom is not to be forsaken or forgotten. Get wisdom! Get understanding! And if you are to get everything else, be sure to have understanding. Understanding is what shows you that not all wisdom is equal. The Bible warns us about the difference between divine wisdom and earthly wisdom. There is a form of wisdom that is carnal and demonic. One that seems right to a man but only leads to death. You should be careful not to fall into this. And He shall [a]direct your paths. As simple as it may seem, trust is one thing that most of us struggle with. We are raised with that siege mentality. One that says “Each man for himself”. Trust seems like an abdication of that power. The power that we get from trying to control everything around us. Yet even when we have that power, we still lack control. There are entities that influence in realms that we cannot physically influence. Lord, I don’t want to live a life of trying to pull all strings together by myself. I choose to trust in you with all my heart. No matter how much understanding I have or that I think I have, I entrust my life to you. I will not lean on my own understanding. As always, we are eternally grateful to see more people picking up the mantle of prayer. Be sure to share this post through your social media pages and such. We are always looking for ways to do more. 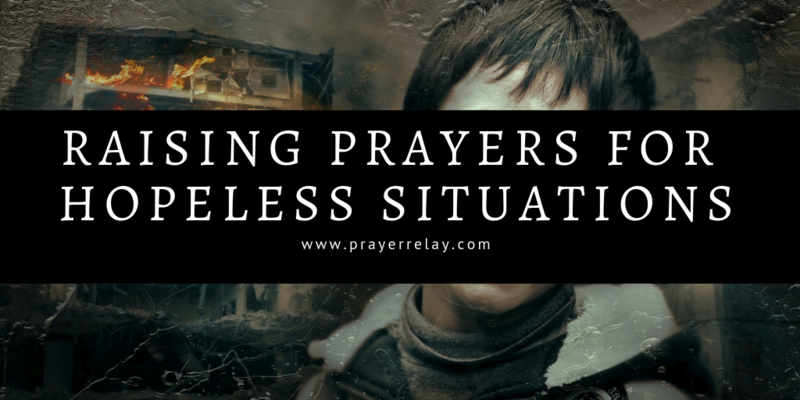 The area of prayer remains underserved. With you as a partner, we can change this. Consider becoming a PATREON. There are several benefits that come with it, beyond making a tangible difference in the ministry of prayer.